Coming from a nice suburban WASP family, I've of course eaten my fair share of meatloaf. Ah, meatloaf. One of the most derided foods of midwestern American cuisine. But I'm here to tell you that today's recipe is no ordinary meatloaf. This is Paul Prudhomme meatloaf, baby. 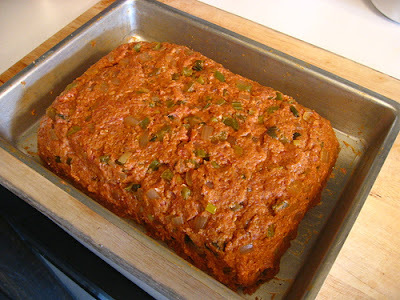 This is the kind of meatloaf that would burn June Cleaver's tongue off and wilt her bouffant! 1) Combine the seasoning mix in a small bowl and set aside. 2) Melt the butter in a large saucepan over medium heat. Add the onions, celery, green pepper, scallions, garlic, seasoning mix, Tabasco and Worcestershire sauce. Saute on medium-high heat until vegetables begin to soften, about 6-7 minutes. Stir well and be careful not to let the mixture stick to the bottom of the pan. 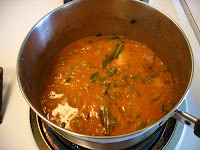 3) Stir in the evaporated milk and the catsup, and cook for 2-3 minutes more, stirring frequently. Remove from heat and allow mixture to cool (I usually put it in the freezer for 15 minutes to speed up this process). 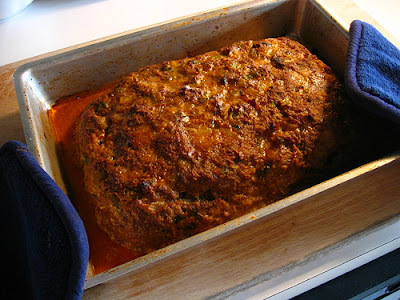 5) Bake uncovered at 350F for 25 minutes, then turn oven temperature up to 400F and cook for another 35 minutes longer (the extra cooking time at high heat will crisp up the outside of the meatloaf. Delicious!). Easily serves 6. 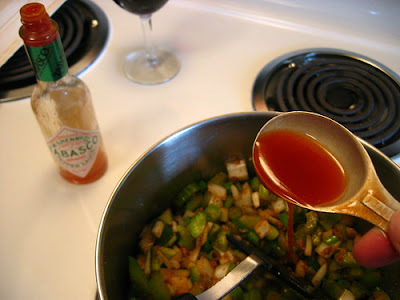 1) If you can tolerate some heat, just add 1/2 a Tablespoon of Tabasco, rather than the full Tablespoon. 2) If you really can't stand hot food, leave out all the Tabasco. 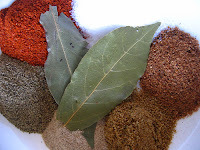 Note that in both cases, I'd leave the spice mix alone with its triumvirate of cayenne, black and white ground pepper. Don't be a total wimp. This really sounds good. I wonder how it would be with turkey instead of beef. Does anyone know if that will require a change to the cooking time? The cooking time should be the same. But I'm not sure I'd recommend using ground turkey. I'd bet that it just wouldn't have the right texture. Of course I'm guessing what the texture might be! There's of course no substitute for actually trying it out and seeing for yourself. And I suppose you could use a mix of ground pork and ground turkey, or a mix of ground beef and ground turkey. I plan to make the cajun meatloaf recipe but without the 2 teaspoons of salt. Why would salt be needed with all the other seasonings??? 1 teaspoon of salt equals 2400 mg of sodium. Nutrition recommendations are generally limit sodium to less than 3000 mg per day; less than 2400 mg per day for mild or moderately high blood pressure. Thanks for your question. Yes you can definitely make this recipe without salt. Note that the original recipe (before I modified it) called for 1 Tablespoon of salt (= 3 teaspoons), so I've already ratcheted it down a bit. Normally I cut all salt out of almost all my recipes when I modify them. As we all know, "using salt is cheating!" But since this is PAUL PRUDHOMME, I have issues with changing up his recipes too much. I feel somehow dishonorable when I do that with his amazing Cajun and Creole recipes. I don't know why. But you can certainly leave out all the salt if you like. I totally agree with you on the health issues. But keep in mind that this dish will serve 6 easily, so your salt intake per serving here will be about 800mg. Not great, but it won't kill you. I know that this is many years after posting date. I make this with 2 pounds of ground chicken and it is delicious!! It is lighter and less fat. Cooking time depends on temperature-@ 1 hour until reaches 170 degrees. Suem, thanks for your comment and thanks for your modification idea! Exceptional. By the way, no worries about leaving a comment long after the posting date: I leave comments open and active on all of my posts for the very reason you posted today. I want my readers to be able to share great ideas with everyone else here at CK, regardless of when those ideas appear. Thanks again for sharing. I have made this many times with ground turkey and it is delish, not AS good as the original but a nice alternative for less fat! Really enjoyed this meatloaf. I added a few tablespoons of Worcestershire sauce and a little garlic powder.